On any given day, spending an afternoon in a beautiful Malibu estate with a million dollar view is blissful. Spending it with Paul Walker is just heavenly. I experienced my slice of heaven a few weeks ago when the Davidoff Cool Water team invited me to enjoy an afternoon of pampering and some one-on-one time with Paul, the new face of one of the world's best-selling colognes. I grew up loving the scent of Cool Water. It's fresh, masculine and above all, cool. So it's no surprise to learn that Paul Walker pretty much embodies all of those traits with a sense of effortlessness and grounded-ness that's both uncanny and refreshing. And it's not solely due to his good looks either. Yes, he's tall, lean, has a chiseled movie star face and a mega watt smile. But that's just dwelling on the obvious. During our twenty minute interview, we discussed a plethora of different topics ranging from his childhood in Santa Barbara, his passion for marine life, and his close to his heart charity. At the end of our interview, I realized that his embodiment of the essence of Cool Water comes from his warm laughter, generous heart, and the fact that instead of just talking the talk (as is the case with many celebs these days) he sprints into action whenever action is needed. Now that's the power of cool. 1. His mom had him at the age of 20. 2. When he first started acting, he worked as a UPS delivery man in the two day air department and also as a busboy in Santa Barbara restaurants. 3. He has a daughter. 4. He studied marine biology in college and plans on completing his degree in the next couple of years. 5. He actively works with the Bill Fish Foundation to tag and study sharks.He has caught (and freed) six great white sharks in one outing! 7. When he's not acting or tagging sharks, Paul spends a lot of time visiting third world countries. 8. Immediately after the Haiti earthquake, Paul and his friends flew to the disaster zone and sprang into action. Within days, they were able to set up a ground medical tent and provide medical attention to hundreds of injured victims. 9. He started a non-profit organization called ROWW, a quick response team that aids in the rescue and recovery process immediately after a natural disaster occurs. 10. 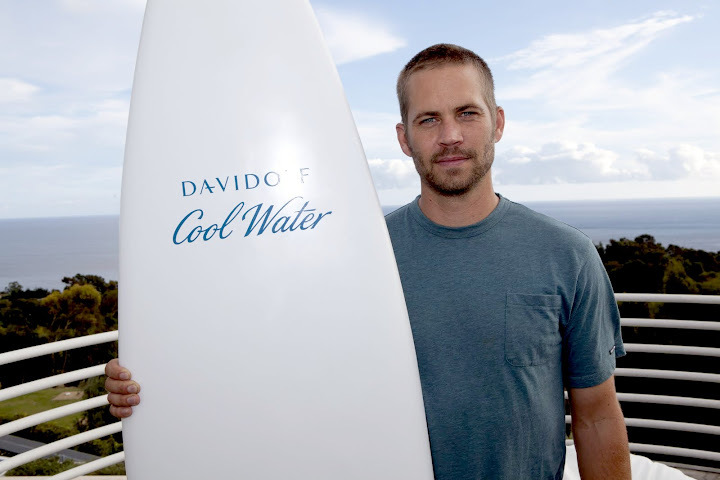 The color of Paul Walker's eyes match the aqua Davidoff Cool Water cologne bottle. Swoon. The use of photo editing magic on a blurry shot of Paul and I. He is absolutely gorgeous. I've been in love with Paul Walker since Varsity Blues. i love your outfit, floral with stripes, good idea!! He's so handsome and the photos are amazing. Looking pretty yourself doll. PS. Thx for your comment on my blog and I would like to follow each other if you like. Hope to hear from you soon. wow, he is a cutie. the atmosphere of the party is awesome-it looks "cool" and fresh. your outfit is cute-i like the stripes mixed with floral. How fun you had this opportunity. Malibu is amazing. And I love how Walker is not just a celebrity, but a marine biologist! Love your blouse, and thanks for swinging by. Love his movies.....interesting personal life he has! btw....you look fabulously chic! Hey! Thank you for your lovely comment :) Love your blog imma follow you back. OMG! i love paul walker!!! he's so cute!!! thanks i follow too!!! WOOOOW,HI DARLING! THANK'S FOR THE COMMENT!! SUCH A GREAT STYLE AND WONDERFUL LOCATION!!!! I'M JEALOUSE !! Oh wow that looks amazing! I'd like to go there! So jealous! um, im totally jealous! lucky you! wow this is wicked, found your blog through wandering on the internet lol. R.I.P. Paul walker. Hi was a very nice person.